The core focus of the Australasian Land and Groundwater Association (ALGA) Limited is to support advances in the prevention, assessment and remediation of contaminated land and groundwater. Reach the right audience to promote your services, products and technologies. When you advertise with ALGA, you are broadcasting your message to a broad base of members including land owners, property developers, industry, consultants, scientist, contractors, regulatory agency staff, government, the legal profession, laboratory staff, financiers, insurers, researchers and academics. 2019 partners of ALGA are entitled to discounted rates. Please contact the office to see if your partnership level qualifies your company for a discount. Advertisers are encouraged to supply their own artwork, alternatively ALGA can design one for you. Please contact the office for graphic design rates. 2019 will see the CRONICLE transition to a web based monthly report. Still read by industry professionals directly involved in the remediation industry, it will focus on providing topical and succinct news stories, industry authored articles, member insights and ALGA interest group analysis. Our 14,000 strong audience will be sent a CRONICLE alert reminder each month. 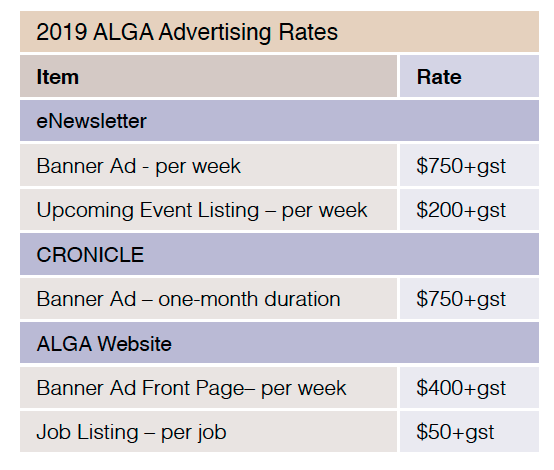 There is a single banner advertising opportunity for $750+gst per monthly report. The banner ad will be displayed in the email alert to our database as well as on the CRONICLE webpage for the duration of the month. 2019 partners of ALGA are entitled to a discounted rate, please contact the office for more information. The ALGA website has on average 3000 hits every week! We offer banner ads that will be viewed by a wide sector of the remediation industry. These can run for any specified period of time, from a week to a year and can include job opportunities, company webpage exposure and event promotion. Rates are $400 + GST per week. ALGA’s prime strength is its industry reach. Through Branch Events, Training and Education programs and Conferences and we provide many advertising options for your organization to take advantage of. Advertisers can supply their own artwork, alternatively ALGA can design one for you. Please contact the relevant department to discuss the best advertising option for your business. Primary event sponsorship entitles your company to be featured exclusively on all promotional event marketing material. Company logo featured on the invitation and event information page. (Including URL link to your webpage). Verbal and visual recognition on event opening slide and all published event material (Report & Slides). Company promotional banner featured at the venue (one single pull up banner, approx. 85cm x 206cm, supplied by you). Company logo featured on event information page. (Including URL Link to your webpage). To purchase Local Branch Event Sponsorship click to register for the event your would like to sponsor and select the sponsorship level wanted. For any further questions about Local Branch Event Sponsorship contact Karoline Willis on branches@landandgroundwater.com.